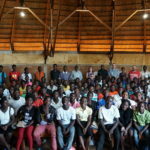 We have had a fantastic week at Nhkata Bay with 22 young entrepreneurs from the North of Malawi. It has been a genuine privilege to get to know these young people and to provide training in business planning, marketing, economies of scale, supply and demand theory and much more. They have soaked it all in and are so eager to learn as you can see in the pictures. We have a fantastic venue donated by Njaya Lodge but the challenges facing young business people have really been brought home to us as we have struggled through power cuts and no water supply. There is hope and a future here, though. These young people want to breed rabbits, chickens, quails and pigs; they want to grow cabbages, onions, potatoes and cassava; and they want to make and sell popcorn, crisps and vegetable oil. We have our final day tomorrow which will be sad for them because they have really bonded as a group but there will be ongoing collaboration and mentoring and we really believe the best is still to come from this group.